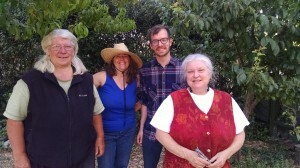 Pat Rasmussen, Heather Wood, Nathan Lusk and Gail O'Sullivan are leading the Olympia Village Building Convergence. Taking action with others in your community is a building block for positive well-being. Community may be described in many ways: your school, neighborhood, church or club. Community can also be defined as the place you live. The Olympia Village Building Convergence consists of residents who are mutually interested in creating places and spaces in and around Olympia that are meant to draw people together through environmental stewardship, cultural sharing, and good old fashioned fun. The Village Building Convergence began in Portland and was organized by the City Repair Project. The annual 10-day event is filled with various workshops that revolve around ecological sustainability and permaculture. The Olympia group is not directly connected to Portland. It has its own structure and events. But the intent is much the same. Pat Rasmussen, Heather Wood, Nathan Lusk and Gail O’Sullivan are leading the Olympia Village Building Convergence. For example, the results of a previous Village Building event can been admired on the exterior wall of the old gas station on the corner of Bethel and San Francisco Streets, across the street from the San Francisco Street Bakery. Upcoming events will involve making honeybee hives, designing street art and telling stories and eating pizza. The OlyVBC also hooks up with other organizations such as the West Central Park and Northeast Neighborhood Association and their events to encourage greater involvement of the community. The ambitious and creative steering committee of the OlyVBC is led by Pat Rasmussen, Heather Wood, Nathan Lusk and Gail O’Sullivan. The team invites you to join them. Pat Rasmussen has helped to establish 70 food forests in Olympia. These are food corridors populated with nut or fruit trees and various berries. 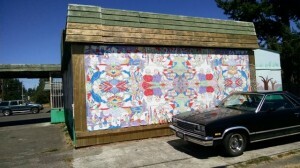 One fabulous example is at The Commons at Fertile Ground across the street from the downtown Olympia library. It’s an oasis of green and peace. Rasmussen has been associated with OlyVBC for eight years and has created deep connections with people and places around town. She delights in sharing with others. This wall painting, one of the earlier summer projects organized by Olympia Village Building Convergence, was created by many hands. Nathan Lusk recently celebrated his 25th birthday. He is a new Olympia resident and was excited to find out about OlyVBC. When Lusk was a student at Sterling College in Kansas he organized annual Community Service Days where hundreds of volunteers served on over forty different projects, all designed to help people in the community. “It was awesome,” remembers Lusk. Heather Wood’s heart beats with a mission to grow genetically diversified honeybees. The Urban Evergreen Bee Sanctuary helps to educate and support the survival of bees. Honeybees are having a difficult time staying alive due to Colony Collapse Disorder, mites and environmental toxins. 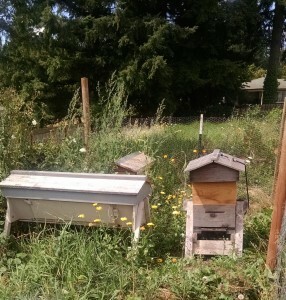 OlyVBC and Wood are teaming up for Top Bar Hive making workshops, where people can help build hives that will be placed in strategic Olympia locations. I’m signed up to make one that will be located at my end of Johnson Point. These new hives will eventually be populated by feral swarms that Wood and others capture. Did you know that annually an ordinary hive will split with the one queen taking her 80,000 followers off to find new digs? Wood hives placed near neighborhood gardens pollinate your plants. The OlyVBC encourages your participation to connect and beautify your community. You can meet people, eat and play – but you don’t have to join or go to regular meetings. Many of us spend a great deal of time in front of screens of one sort or another. OlyVBC gives you the chance for actual face time. 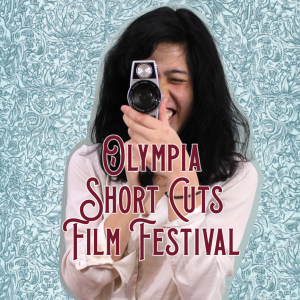 To learn more, visit the Olympia Village Building Convergency website or follow OlyVBC on Facebook. The group’s Facebook page is the best place for updated information on events and workshops.